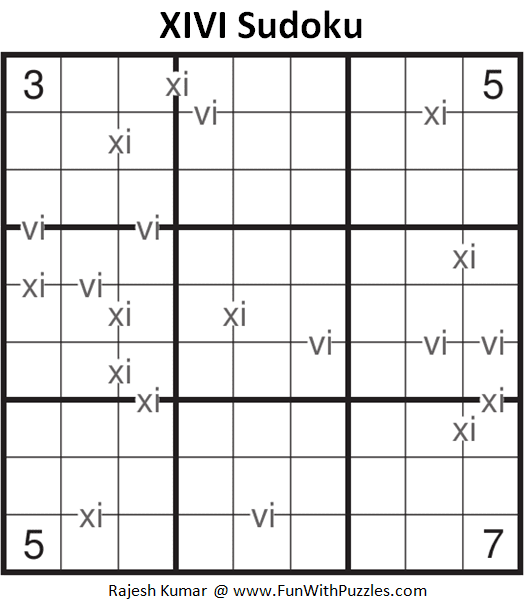 XIVI Sudoku Puzzle is variation of of XV Sudoku puzzle. In XIVI Sudoku, sum of consecutive number is given if the sum is 11 or 6. In XV Sudoku, sum is given if the sum is 10 or 5. This Sudoku type is relatively new to me and I prepared it for Asian Sudoku Championship 2018 and now publishing this XIVI Sudoku puzzle as part of Fun With Sudoku Series as 285th Sudoku Puzzle in this series. Standard Sudoku Rules apply. Additionally if an XI is given between two adjacent cells, the digits in those cells sum to 11. If a VI is given between two adjacent cells, the digits in those cells sum to 6. If an X or V is not given,the two digits cannot sum to 6 or 11. Answer of this XIVI Sudoku puzzle can be viewed by clicking on button. Please do give your best try to solve this Sudoku puzzle before looking at the answer. This XIVI Sudoku puzzle I am publishing as #285th Sudoku puzzle in Fun With Sudoku Series. Here are the next and previous Sudoku puzzles published in this Sudoku series.